During a time of year when the minds of many Artesians will soon be occupied with lengthy grocery lists, Packs of Love is asking residents to remember those whose Thanksgiving tables would remain empty without the generosity of others. The local nonprofit is currently in the midst of its 2017 Thanksgiving campaign, and aiding its efforts is simple: The price of a couple of movie tickets is all it takes to ensure one local family has a happy holiday. With each $20 gift, the group will be able to fill a tote bag with all the makings of a Thanksgiving meal — such as vegetables, stuffing and potatoes — as well as provide the family with a voucher to purchase the star of the show, the meat, at Fenn’s Country Market. Most of the kits will be distributed during Packs of Love’s other Thanksgiving event: A free hot meal prepared and served by employees of Halliburton. The meal and distribution are scheduled for Tuesday, Nov. 21, at First Baptist Church. Donations for Thanksgiving bags may be mailed to Packs of Love at P.O. Box 1824, Artesia, N.M., 88211-1824, with checks made payable to “Packs of Love.” For more information, Greenwood can be reached at 703-8130. Businesses and individuals interested in participating in Packs of Love’s upcoming Christmas effort can also begin contacting Greenwood. This year’s list includes a fleece blanket, an activity (such as a board game or interactive toy), art supplies (coloring books, Play-Doh, etc. ), and a package of socks. “First Baptist Church’s congregation also does food bags for the families at Christmas, which are especially important, because we don’t get to feed those kids for the two weeks school is out for the holidays,” Greenwood says. 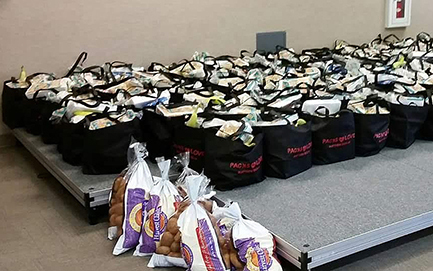 Packs of Love, which has been operating in Artesia for the past four years, is entirely volunteer-driven and puts all funds received toward its holiday outreaches and its primary mission: making sure local students in need still have access to nutritious meals when school is not in session. To that end, Greenwood — who took the organization’s helm in 2014 — and her fellow volunteers meet at 11:45 a.m. each Thursday during the school year at First Baptist to fill sacks of food that are distributed each Friday to students, identified by their schools, who may not receive the nourishment they need outside the cafeteria. Packs of Love is currently aiding students in grades K-9, with smaller participation numbers in the grade levels above elementary. No students from Artesia High School receive sacks, just three at Park Junior High, and 12 at Zia Intermediate. Greenwood says that’s primarily the result of peer pressure. Anyone who wishes to help pack bags is invited to simply show up at one of the Thursday assembly sessions. Those who would rather provide monetary aid may donate using the address above. The once-again small amount of $20 provides enough food for one student for one month. Greenwood says she is grateful to all the local businesses and groups that aid Packs of Love in its efforts, such as Fenn’s — which not only helps with food purchases but delivers the items to the church — Halliburton, First American Bank, which sends a number of employees each week to aid in preparing food sacks, and Altrusa International, whose recent Feed Artesia drive partially benefited the group. Packs of Love is truly a community effort, and that, Greenwood says, speaks to the heart of Artesia. “We never know what these kids’ home lives are like, we don’t know what their situations are,” she says. “I’ve got these people who donate time and money, and this group that shows up every single week to pack bags, and they are never going to meet these children… they don’t know them.